There really are no words to describe yesterday. It still seems so surreal, so unimaginable, so heartbreaking. As a runner, and marathoner, there is no greater glory than crossing the finish line after a race. To have this innocence and joy stripped from so many is unfair beyond words. My thoughts are with the runners, spectators, volunteers, race crew and everyone that was involved with the Boston Marathon. I only hope that this will not turn people away from this beautiful sport, but bring more out to experience it, to share in the compassion we have. 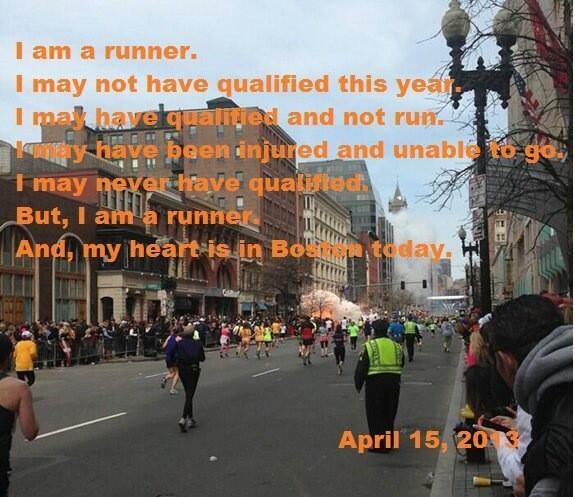 Thankfully, runners are strong, and this has shown throughout the running community in the last 24 hours. I have never been so proud to be a runner and so glad to be part of a community that will come together and be stronger than ever. So please keep this community and their families in your thoughts and if you’re able, go run for Boston. We are runners and we are strong. Nicely said, Chelsea… appreciate your heartfelt words and the awesome graphic.